Consumer Reports regularly publishes health information to aid the consumer/patient in making decisions. And that’s a good thing. But also important is having the most current information, which their January 27, 2015 article, titled “The surprising dangers of CT scans and X-rays,” does not. All of the cautions about imaging tests that are listed in the Consumer Reports article are valid: ask why the test is necessary; check the credentials of the imaging specialist; ask for the lowest effective dose; avoid unnecessary repeat scans. And today, it was the American Board of Internal Medicine (ABIM) who said they were sorry for breaking the hearts of all the cardiologists in the U.S. of A. 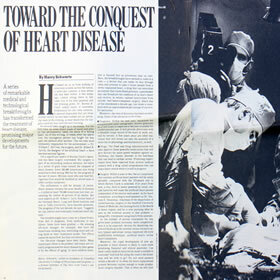 Almost two decades ago, interventional cardiology pioneer Dr. Spencer B. King III penned an article for Circulation titled, “Angioplasty From Bench to Bedside to Bench.” Dr. King’s article was a recounting of the history of the development of the angioplasty balloon catheter by his colleague at Emory University, Andreas Gruentzig. This week started off with me watching a demonstration of fractional flow reserve (FFR) during multivessel PCI. This very instructive case was transmitted live from Hammersmith Hospital in London and featured Dr. Justin E. Davies showing how to perform FFR and, more importantly, how the use of FFR changed the treatment plan for this patient. Will a Denial of Service DOS Attack Hit New York State Medicaid Patients? Or Perhaps Your State? What does a Denial of Service Attack have to do with stents, angioplasty and PCI?